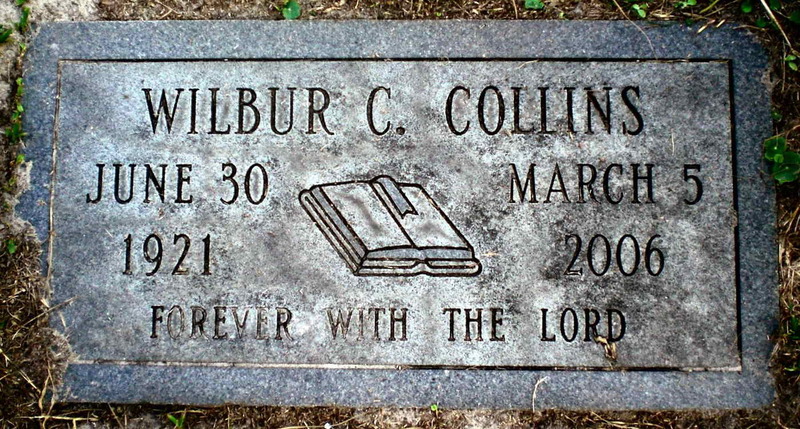 Mr. Wilbur C. Collins, 84, died March 5, 2006. Our husband, father, grandfather and brother left the world as he lived in it, conscious of God, fearless of death, and at peace. Wilbur always said to obey God, love your family and serve your country. He certainly lived his belief. Wilbur was a native of Jax. [Jacksonville, FL] and proudly served in the US Army from 1940 until his retirement in 1978. He served with the 504th, 503rd and 509th Parachute Infantry and the 82nd Airborne. His career included America's first combat parachute insertion on November 8, 1942 in North Africa and was Missing in Action after a parachute assault in Avellino, Italy. During WWII Wilbur made three combat jumps and one beach assault. Wilbur was a founding member of Victory Baptist Church where he served as a Deacon. He established the Sunshine State Coachman Club, serving as the local and state chaplain. Wilbur spent many years traveling the United States as a Christian messenger to fellow travelers. Wilbur was blessed with two wonderful wives, Joyce Collins, whom he married in 1999 and Viola Rigdon Collins, to whom he was married for 53 years before her death in 1998. Survivors include his wife, Joyce Collins; 2 children: Shirley (Winston) Sapp and Billy Collins; 2 grandchildren: Tim (Jeanne) Sapp and David (Samantha) Collins; 4 great grandchildren: Sydnei Sapp, Carson Sapp, Brooke Collins and Jared Collins; 1 brother: Robert Collins; 3 step-sons: David (Wanda) Smith, Steve Smith and Larry Smith. Wilbur was a member, usher and worked with the Visitation Program at North Jacksonville Baptist Church, 8535 N. Main St., where funeral services will be held at 11:00 AM on Wed., March 8, 2006 with Dr. Herb Reavis officiating. Burial will follow in Evergreen Cemetery with Military Honors. The family will receive friends from 6 to 8 PM on Tuesday (TODAY) at the North Jacksonville Chapel of PEEPLES FAMILY FUNERAL HOMES, 2220 Soutel Dr., near Lem Turner Rd. Contributions may be made in Wilbur's memory to the North Jacksonville Baptist Church Building Fund. Grave marker for Wilbur C. Collins in Section 6 Block 3 of the Evergreen Cemetery, Jacksonville (Duval county), Florida. Wilbur enlisted in the National Guard at Jacksonville, FL on 25 November 1940. He was subsequently assigned to the 509th PIR. T/5 Collins was transferred from the 509th to the Service Co, Det #1 508th on 18 February 1945 and then to the 13th Airborne on 10 March 1945.